A range of displacement sensors that are based on a range of technologies including LVDT (linear variable differential transformer), strain gauges and rotary potentiometers, known as 'String Pots'. Also a comprehensive range of load cell and force sensors to suit a huge range of applications, plus rotary and static torque measurement sensors with mechanical interfaces including square drive, parallel keyed shaft and flanged, plus customised versions. Position & Displacement Sensors, including LVDT's , draw-wire and submersible types. A range of Load Cells are available for most application types, examples are miniature, low-profile, inline, compression, bending beam, multi-axis and weighing platforms etc. 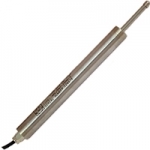 Torque sensors are available on request, with several types available including Dynamic, Rotary and static types. Various outputs are available. LVDT Displacement Transducer +/-25mm stroke, sprung-loaded , 0-10V output.